On the morning of July 22nd the IDF announced the completion of the overnight evacuation of 800 Syrian ‘White Helmets’ personnel and their families from southern Syria, through Israel and into Jordan. The evacuees arrived at the border with Israel, and the IDF opened the gates and let them through. Medical treatment was provided to those in need, and the evacuees were provided with food and water. That propaganda has indeed been vigorously promoted by the Assad regime, Russia and their sympathisers. However, it has also been exposed and debunked – as the Guardian reported in December 2017. “The campaign to discredit the White Helmets started at the same time as Russia staged a military intervention in Syria in September 2015, supporting President Bashar al-Assad’s army with airstrikes bombarding opposition-held areas. Almost immediately, Russian state media such as RT and Sputnik started falsely claiming that Isis was the only target and throwing doubt on the bombings of infrastructure and civilian sites. In April of this year BBC Trending produced a report titled “Syria war: The online activists pushing conspiracy theories” which includes a whole section on conspiracy theories relating to the ‘White Helmets’. Graphika found 20 million messages about the White Helmets, split between tweets in support and in opposition. Among the opponents, Kelly says, Sarah Abdallah was “by far the most influential”, followed by Vanessa Beeley. The firm found that Sarah Abdallah’s account was primarily followed by a number of different interest clusters: supporters of pro-Palestinian causes, Russians and Russian allies, white nationalists and those from the extremist alt-right, conservative American Trump supporters, far-right groups in Europe and conspiracy theorists. Anyone getting their news exclusively from the BBC will not be aware of the fact that heavy fighting has been taking place for some weeks in the Daraa district of south-western Syria. 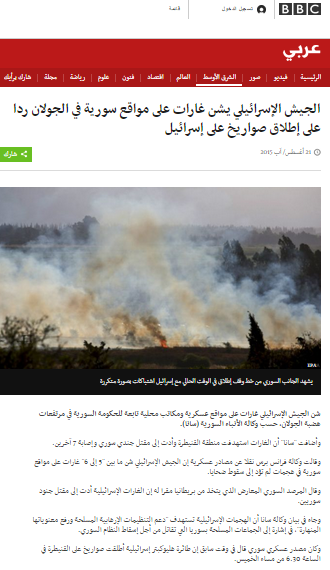 The BBC also did not report any of the numerous recent cases of spillover fire into Israel: ‘side effects’ of fighting between regime and opposition forces in the Quneitra area. BBC audiences might therefore have been rather puzzled to find an article on the BBC News website’s Middle East page on July 7th titled “Syria crisis: US, Russia and Jordan agree ceasefire deal“. A follow-up report appeared on the Middle East page on July 9th under the headline “Syria ceasefire: US and Russia-backed deal in effect“. “A ceasefire brokered by the US and Russia has come into force in south-western Syria. It was announced after Presidents Donald Trump and Vladimir Putin met for the first time at G20 talks on Friday. The truce is also backed by Jordan. “The agreement does have a serious disadvantage from an Israeli perspective: It halts the advance of Iranian militias and Hezbollah, but fails to completely remove them from the area, as Israel likely demanded behind the scenes. 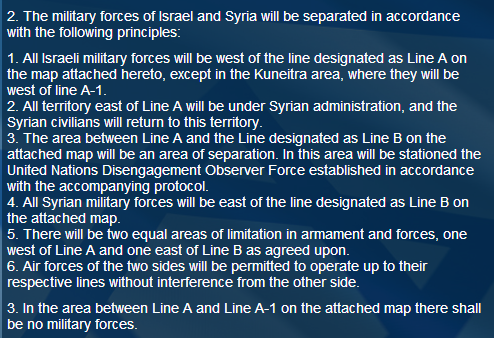 This means that if and when the ceasefire is violated, the forces supported by Iran and Hezbollah would be able to continue their advance towards the Syrian-Jordanian border and the Syrian-Iraqi border, which will make it possible for them to create a strategic corridor to the Mediterranean Sea. Even worse is the fact that they would be able to advance and establish a stronghold in the Golan Heights. The Syrian regime, Hezbollah and Iran have a totally different interest in a ceasefire: Assad and the Iranians have realized that they are incapable of conquering the city of Daraa on the Jordanian border and that the rebels—to ease the pressure on Daraa—are successfully attacking them near new Quneitra in the Golan Heights, where the spillovers that Israel responded [to] originated. The Syrian army is pressed in the Quneitra area. It’s failing to advance in Daraa despite help from Iran, Hezbollah and Russia, and therefore has no other choice but to agree to a ceasefire. Obviously there is a much broader story to tell than the one presented in these two superficial BBC News reports that cannot be said to meet the BBC’s mission of providing news “of the highest editorial standards so that all audiences can engage fully with issues across the UK and the world”. With the BBC’s Jeremy Bowen on the ground in northern Syria, audience attentions have been focused on that region where, according to the corporation’s reports, the ceasefire which came into effect on the evening of September 12th is “largely holding“. However, another front is currently rather less quiet. Throughout the past week or so, multiple incidents of mortar fire from Syria into the Israeli Golan have taken place – attributed to spill-over from the heavy fighting between opposition groups and regime forces and their supporters near the border which continued under the terms of the ceasefire agreement. On September 13th, after Israel responded to one of the incidents of cross-border mortar fire, the Syrian regime claimed to have shot down two Israeli aircraft. 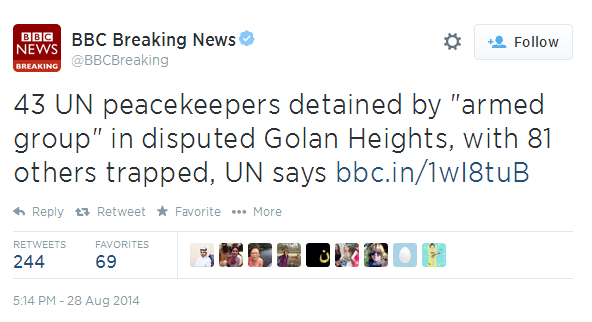 That claim was swiftly refuted by the IDF. “The statement from the Syrian army said one aircraft was downed over the skies of the Syrian town of Quneitra, near the Israeli side of the Golan Heights, and the other, a drone, was shot down closer to Damascus. “Our air defenses blocked the attack and shot down the military aircraft in (the southern province of) Quneitra and a drone west of Sa’sa” in the province of Damascus, said the statement carried by state news agency SANA. The alleged achievement was highlighted widely in Syrian state media. The IDF in a statement confirmed it had been shot at, but said aircraft used to target Syrian positions overnight were safe. Once again, the degree of reliability of information put out by the Syrian regime – which the BBC has in the past unquestioningly amplified and promoted – is glaringly apparent. 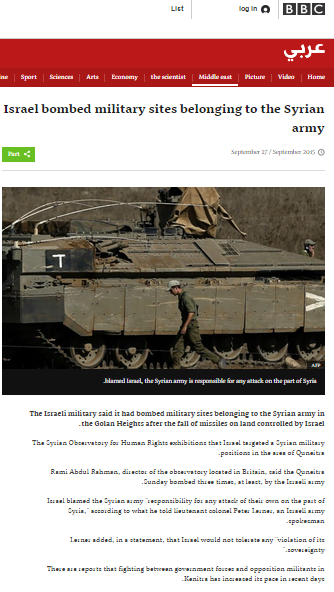 The Syrian regime’s claim was the subject of a report – “Syria says it shot down an Israeli airliner and Israel denies” – which appeared on the BBC Arabic website on September 13th. The BBC’s English-speaking audiences, however, have not been informed of that incident or the recent tension-raising uptick in cross-border mortar fire from Syria into Israel. Readers may recall that some two and a half years ago the BBC got itself into hot water by promoting Assad regime propaganda on its English language website. Two days after the appearance of an article claiming that “Israeli strikes on Syria ‘co-ordinated with terrorists'” the corporation responded to considerable public outcry by amending the headline. Apparently though, lessons have not been fully learned from that incident. As has previously been noted here, on August 21st a report appearing on the BBC News website’s Middle East page amplified a claim promoted by Syrian state TV according to which five men killed in an Israeli strike following a missile attack on northern Israel were “civilians”. BBC Arabic however went even further. In a report dating from August 20th relating to Israeli airstrikes on regime targets in Syria which took place in response the same day’s missile attack on Israel, readers were provided with unadulterated Syrian state news agency propaganda. There is of course nothing new about this particular genre of Syrian regime propaganda and Assad himself recently promoted it in an interview with Hizballah TV. “The real tools that Israel is using, which are more important than the recent attacks, they are the terrorists in Syria,” Assad said. In the Middle East there are already countless media outlets reporting according to a particular political or ideological agenda. It is supposed to be the job of the BBC – including BBC Arabic and other foreign language services – to distinguish itself from regime-run media by providing audiences with accurate and impartial reporting which will enable them to understand what is fact and what is fiction. Uncritical and unchallenged amplification of obviously delusional Syrian regime propaganda is clearly not conducive to achieving that goal. 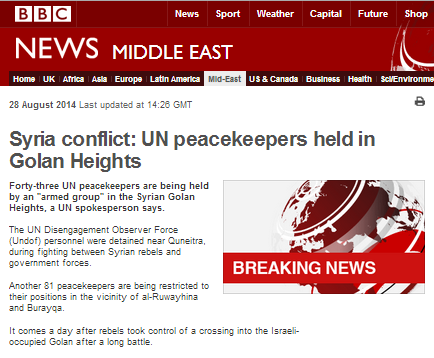 Another notable point concerning this BBC Arabic report is that the caption to the main photograph illustrating it states that “The Syrian side of the ceasefire line with Israel is currently witness to frequent clashes”. Readers would naturally therefore assume that the image shows the aftermath of one of those clashes on “the Syrian side of the ceasefire line”. However, the exact same image was used in another BBC article produced on the same day and there it was described as showing northern Israel: “Rockets fired into Israel caused brushfires after hitting open areas near Galilee” [sic]. One of those captions is obviously inaccurate and misleading. At around 5:30 pm on the afternoon of August 20th, four missiles fired from Syria hit areas on the lower flanks of the Golan Heights and in the Galilee Panhandle. 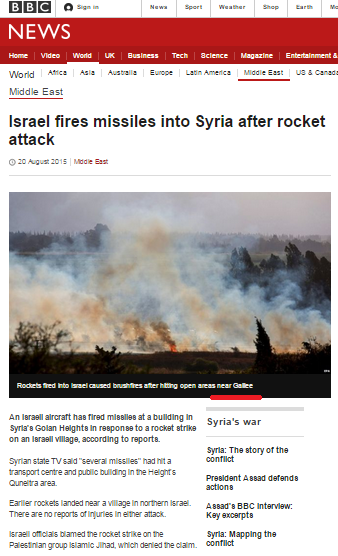 Several hours later an article appeared on the BBC News website’s Middle East page with the typical ‘last-first’ reporting style title “Israel fires missiles into Syria after rocket attack“. Like all BBC News content, that article’s aim was to “[b]uild a global understanding of international issues” and to inform by means of the provision of “reliable and unbiased information of relevance, range and depth” whilst adhering to standards of accuracy and impartiality. But were those criteria met? Two of the missiles landed in the Upper Galilee district – not “near” it – and we know that the BBC is aware of that because it later quotes an IDF statement. 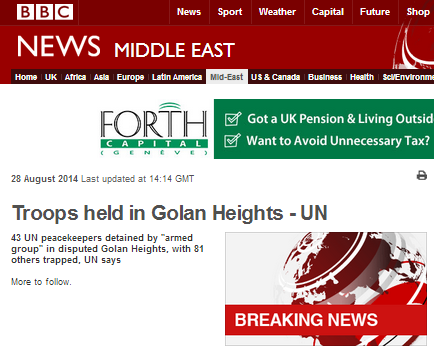 Obviously the main story here is an unprovoked missile attack on civilian targets across an international border. The wider significance of that incident and the effects of the attack on the people it targeted receive no coverage in this BBC report, which devotes almost three times more wording to the topic of the Israeli response than to the missile attack itself. The bulk of the 318-word article, however, is devoted to the subject of the Palestinian Islamic Jihad’s denial of involvement via a spokesman over 250 kms away in the Gaza Strip. 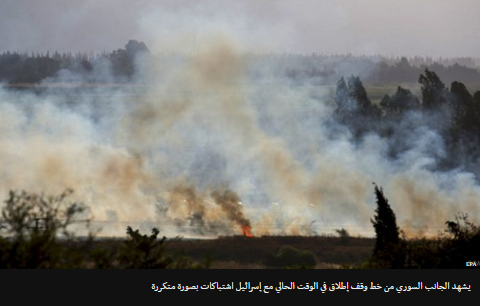 “Israeli officials blamed the rocket strike on the Palestinian group Islamic Jihad, which denied the claim. A statement released by the Israeli military said the rockets that hit the upper Galilee region “were launched from the Syrian Golan Heights… by Islamic Jihad, sponsored by Iran”. The statement went on to say that Israel “holds the Syrian government responsible for attacks emanating from Syria”. Islamic Jihad had previously threatened reprisals should one of its activists in Israeli detention, Mohammed Allan, die of a hunger strike, but Mr Allan called off his fast on Wednesday after an Israeli court suspended his detention. “Islamic Jihad’s leaders are based in the Syrian capital. Dawoud Shehab, a spokesman for the group who is based in Gaza, denied it had fired on Israel. In other words, readers are encouraged to view Israeli army statements on this incident as being influenced or dictated by the Israeli government’s stance on the P5+1 (not “US” as stated here) deal with Iran known as the JCPOA. It is not clarified to readers that the cross-border attack was launched from one of the few areas along the Syrian border with Israel that are still held by the Assad regime – which is of course heavily dependent upon Iran and its proxies at present – and the obviously relevant context of prior Iranian and Iranian-backed activity along that border is absent from this report. Towards the end of the article readers find more evidence of the BBC’s geographically challenged reporting, tortured phrasing and predictable whitewashing of an internationally recognized terror organization. A “border” was obviously not “involved in the exchange”: borders do not fire missiles at civilians. Neither is it clear to which border the BBC refers – the Israel-Lebanon border as implied by its reference to the 2006 war or the Israel-Syria border across which these latest missiles were actually fired but where there was no fighting during the 2006 war. Hizballah does not confine its activities to attacks on the Israeli military and it is certainly not independent – as evidenced by its Iranian patronage. The context of why that war began and the obviously relevant history of the pre-1967 Syrian attacks on Israeli villages in the Galilee Panhandle and elsewhere which made it necessary for Israel to take the Golan Heights are not included in that partisan account. So did readers of this article really get the “reliable and unbiased information of relevance, range and depth” which would enhance their understanding of this incident and its wider implications? Hardly – and as long as the BBC continues to whitewash Iranian backed terrorist organisations and the ideology underpinning them, that will remain the case. 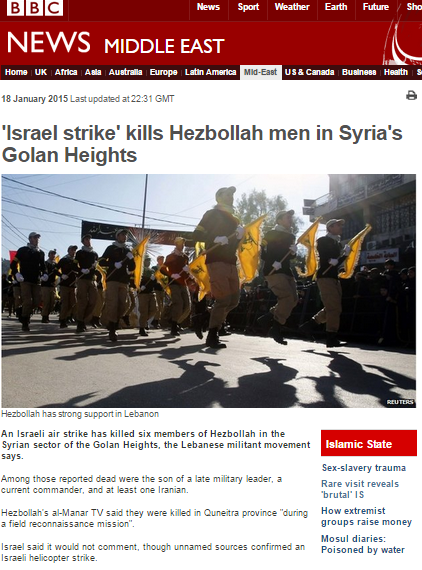 On January 18th the BBC News website published a report titled “‘Israel strike’ kills Hezbollah men in Syria’s Golan Heights” which relates to an incident near Quneitra on the Syrian side of the Golan Heights earlier in the day. The report includes several features worthy of note. With regard to the incident itself, the report gives a reasonable representation of the information which was available at the time of publication. “An Israeli air strike has killed six members of Hezbollah in the Syrian sector of the Golan Heights, the Lebanese militant movement says. Those who died include Jihad Mughniyeh, the son of a top military commander killed in 2008, and Mohammed Issa, a Hezbollah field commander, Hezbollah officials said. The Iranian news agency Fars has since confirmed the death of IRGC officer Gen. Mohammad Ali Allahdadi and a Lebanese source told AFP that in all twelve people were killed in the strike – six from Hizballah and six Iranians – although other reports have presented different information. 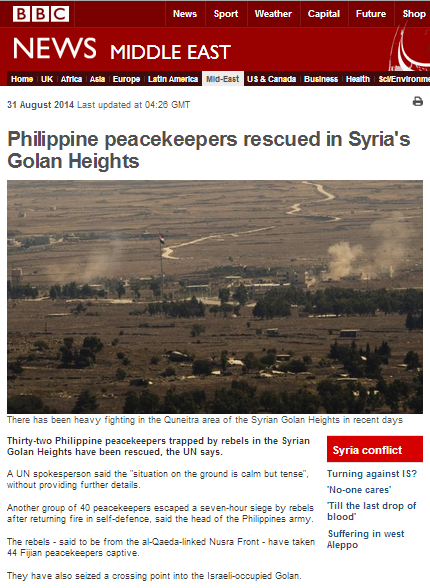 With regard to the key question of what a convoy of Hizballah operatives and Iranian Revolutionary Guards were doing near the border with Israel on the Syrian side of the Golan Heights, the BBC quotes the version of events promoted by Hizballah media. “Israel said it would not comment, though unnamed sources confirmed an Israeli helicopter strike. “The incident comes days after a warning to Israel by the Hezbollah leader, Hassan Nasrallah, that his forces might retaliate against what he called repeated Israeli strikes inside Syria. Those quotes come from an interview given by Nasrallah on January 15th to Al Mayadeen TV in which he explained the ‘logic’ behind the statement highlighted in the BBC’s account, according to which a Lebanese terrorist organization backed by Iran is prepared to attack Israel because of that country’s perceived actions in Syria. “A key ally of Syrian President Bashar Assad, Nasrallah, who has sent thousands of fighters into Syria to help defend the regime, said that Israeli strikes on Syria “target the whole of the resistance axis”, which includes Hezbollah, Damascus and Tehran. Nasrallah said in the interview that Hezbollah was ready to fight a new war against Israel in Lebanon and renewed a threat to invade the Galilee region of northern Israel. Hezbollah fighters “must be prepared”, he said. Like much of the media, the BBC’s report focuses on one of the people reported killed. “Jihad Mughniyeh is the son of Imad Mugniyeh, who was killed in a bombing in a bombing in Damascus in 2008. Hezbollah blamed Israel for the death, but Israel denied it. Mughniyeh’s record of course included a lot more than hostage-taking as the Lebanese newspaper The Daily Star pointed out – but the self-styled ‘standard-settling’ BBC did not. 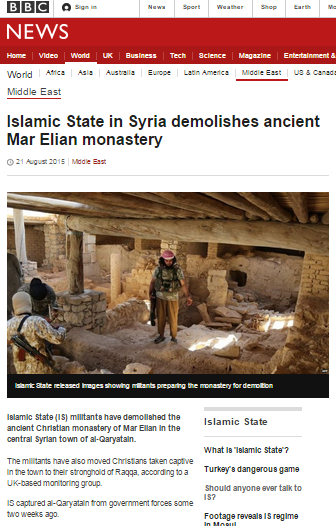 The BBC’s descriptions of Hizballah throughout the report fail to note that it is an internationally designated terrorist organization (or even to mention the word terror) or that its ‘Al Manar’ TV station quoted by the BBC in this report was declared a Specially Designated Global Terrorist Entity by the United States Treasury and is also banned in several European countries. At the bottom of the article appears an insert which likewise does nothing to enhance BBC audiences’ understanding of the real nature, record and agenda of Hizballah and of course makes no mention of the fact that according to assorted UN resolutions, it should have been disarmed years ago. 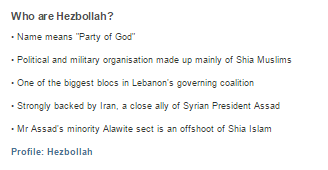 The link included at the bottom of that insert leads to the December 2013 version of the BBC’s profile of Hizballah which, as readers may recall, was amended to present a much softer picture of the terrorist organization than the profile it replaced by means of airbrushing Hizballah’s terrorist designation by numerous countries worldwide, its terrorist activities outside Lebanon, its involvement in the murder of Rafik Hariri and its role in the Syrian civil war and with no mention made whatsoever of Hizballah’s criminal activities around the globe. Obviously BBC audiences will not be able to understand the significance and implications of terrorists and IRGC officers on Israel’s border as long as the BBC continues to fail to represent Hizballah properly.